Defence Minister Stephen Smith has announced Australia has requested pricing and availability for a fifth C-17A Globemaster III strategic airlifter. The announcement was made at the Chief of Air Force’s dinner in Melbourne, a major event to coincide with the 2011 Australian International Airshow. During a doorstop interview at Avalon on Tuesday morning, the Minister wouldn’t be drawn on possible timing for the acquisition, saying only that it depended on the outcome of the FMS inquiry. In a classic case ‘if you build it, they will come,’ the C-17 has quickly proven indispensible to the ADF since being declared operational in 2007, flying regular support missions into Afghanistan, and supporting disaster relief missions throughout the region. 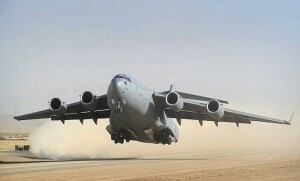 The RAAF has long held ambitions to acquire at least one additional C-17 in order to have a better balanced fleet of aircraft and to cover aircraft during maintenance periods.